Thirteen years after its final episode aired, the iconic and beloved series ‘The X-Files’ returned to television screen. With film and television in the midst of a nostalgia boom, it wasn’t much of a surprise that the series would return, but even for those uninitiated to the series, the enormity of its return was obvious. ‘The X-Files’ is still an icon of television, one that launched countless imitations and has influenced the TV landscape ever since, so returning to the exploits of Special Agents Fox Mulder and Dana Scully was always going to be a risky enterprise. Here’s the thing though - I haven’t really watched ‘The X-Files’ before. I’d seen a few episodes here and there, but never dedicated any time to it. That puts me in an interesting position to review the Blu-ray release of this tenth "event" season, testing whether this season renewal is only for the dedicated fans, or whether it can bring a new audience to an already established classic. These six new episodes see Mulder (David Duchovny) and Scully (Gillian Anderson) reuniting and reopening the X-Files, prompted by information coming to light that calls into question not just the possibility of human encounters with extraterrestrials, but their entire investigative history. While the first and final episodes link back into creator Chris Carter’s wider mythology, the intervening episodes return to the "Monster of the Week" format so closely associated with the original series. Even without a larger knowledge of ‘The X-Files’, you can see how closely this new series is sticking to its legacy - from the scripts to the visual style to the opening titles, everything is fashioned to fit these new episodes neatly in with what came before. A cavalcade of returning characters march through the series, and even though as an uninitiated I often didn’t know who they were, I was still able to take in their significance, and there is a certain enjoyment with the series of not always having things explained. There are also steps taken to fill in important gaps for new viewers which are greatly appreciated. Unfortunately, the stories themselves aren’t always the strongest. They range from the interesting to the confusing to the downright lame, and the often stilted writing doesn’t really help. There are flashes of something bigger and grander at play (particularly in the gorgeous flashback moments in the first episode), but it never quite achieves the ambition it clearly has in mind. The great joy of the series though has always been Duchovny and Anderson, and after a bit of a stumble at the beginning (particularly for Duchovny finding his feet as Mulder again), that same indescribable chemistry falls into place, making every moment they’re on screen together just as thrilling. Anderson in particular is a real delight, but considering how terrific she has always been, that shouldn’t come as a surprise. The rest of the cast is a balance of wonderful and misplaced - Robbie Amell and Lauren Ambrose make for a lovely new FBI partnership, a kind of younger Mulder and Scully, but John McHale just doesn’t gel as conspiracy nut Tad O’Malley. His style is still just a bit to broad and comic to fit what is being asked of him. Even for all its flaws and its slavish commitment to nostalgia, the new series of ‘The X-Files’ does have a lot of charm and entertainment value. There’s something that's still arresting about the basic premise: a sceptic and a believer working together to investigate the supernatural and unbelievable, and that one important element is preserved in its entirety here. Even with my very basic knowledge of the original series, I still found myself taken in by it and determined to go back and catch up on everything I’ve missed in the previous seasons. Whether its satisfies the long-term fans I cannot say, but for this new initiate, it certainly grabbed my attention. The tenth season won’t blow you away visually like a series such as ‘Game of Thrones’, but the 1080p 1.78:1 transfer of the six episodes won’t leave anyone disappointed. It’s clear and crisp, capturing the often grimy texture of the production design, and nothing is lost in the often dark palette of the cinematography. The DTS-HD MA 5.1 tracks are also pretty much as you would expect, punchy but without too much going on. Compared to most current series, the new ‘X-Files’ isn’t pushing towards a cinematic quality, and in that sense this Blu-ray release comes up a treat. Even for all its flaws and its slavish commitment to nostalgia, the new series of ‘The X-Files’ does have a lot of charm and entertainment value. This Blu-ray released is packed with extras, including a number of audio commentaries, deleted material and making-of documentaries. ‘43:45 - The Makings of a Struggle’ (53:35) takes a look at the development and making-of the first episode of the series, and how Chris Carter was able to reconcile what we already know about Mulder and Scully’s relationship through the series and the films with the time that has passed. ‘Season X’ (1:23:16) covers the making of the rest of the series, how each of the individual episodes were approached, and the events that led to the revival of the series to begin with. Both documentaries are fun of detail, with on-set material bolstered by interviews with all the key players. This is the kind of material all TV series should come with, and in many ways is even more fascinating than the series itself. In featurette ‘Monsters of the Week’ (10:54), comedian and actor in the new series Kumail Nanjiani looks at some of the iconic monsters from the original series, while ‘The X-Files: Green Production’ (2:44) is a quick look at the ways the shoot aimed to be as environmentally conscious as possible. The final major extra is ‘Grace’ (9:36), a short film directed by Karen Neilsen, the script coordinator on the series. Even though it has nothing to do with the series, it’s a gorgeous and unexpectedly grizzly little film that could easily be the premise for an episode. The set is rounded off with some deleted scenes (5:21) and a gag reel (9:38). Overall, this is one of the best packages released for a TV series in a long time. If only this much effort was put into more releases. The 'The X-Files: The Event Series' competition has now closed. Winners will be announced shortly. Competition opens at 5pm AEST on Sunday 22nd May 2016 and closes at 11:59pm AEST on Sunday 29th May 2016. Five winners will be chosen at random on Monday 30th May 2016. To successfully win, entrants must fulfil the above entry conditions before the time the competition closes. Current members/followers are eligible to enter the competition. Only one entry per person. Only one winner per household. To be a valid winner, the entrant must not have won a prize from SWITCH within the last 28 days. Each winner will receive one Blu-ray copy of 'The X-Files: The Event Series'. By entering, you agree to receive occasional emails from SWITCH in the future. If you decide to unsubscribe from these updates, any further entries will not be applicable. Only Australian residents are eligible to enter. 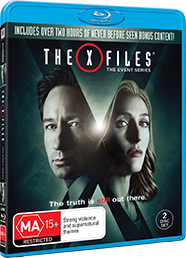 'The X-Files: The Event Series' is available on Blu-ray and DVD on Wednesday the 25th May 2016 from Twentieth Century Fox Home Entertainment.